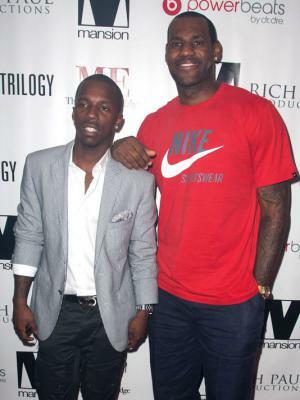 Rich Paul was born on 16 December 1981, in Cleveland, Ohio USA is an American sports agent, famously known as the owner of Klutch Sports Group, and represents players including LeBron James, Trey Lyles and Eric Bledsoe to name a few. So how much is Paul’s net worth? As of early 2016, it is reported by sources to be $10 million, gained mostly from his years of representing athletes, particularly in basketball. Paul went to Benedictine High School in Cleveland but instead of taking up a college education, he became a businessman, buying throwback jerseys or vintage jersey designs from former players, buying them in jerseys in Atlanta and then flying them to sell in Cleveland. Selling vintage jerseys only took Paul so far in terms of his career and wealth. His life changed when he met long time friend and star athlete LeBron James in 2002, at the Akron-Canton airport – Paul was on his way to Atlanta to buy items for his throwback jersey shop and James on his way to Atlanta as well to be part of the Final Four. The latter was impressed by his collection and later exchanged contact details. For a few months, James helped Paul with his business, endorsing him to various suppliers of throwback jerseys and getting discounts. Paul has since then been part of his closest circle of James’ friends. Paul was soon earning $50,000 a month as a part of James‘ circle of friends, going along on tours and attending parties, practice, photo shoots and commercials, basically just hanging out. Paul on the other hand wanted to be more than just a friend, so along with James, Maverick Carter and Randy Mims, they started a marketing firm “LRMR”, a sports and brand management service which in its formative years focused on the branding of James’ name. Through the company he learnt about the world of sportsmen and women, and steadily built his net worth. Despite not having any college degree, because of his love for basketball, being a former player himself, Paul wanted to represent basketball players and become an agent. He then began working with Leon Rose at Creative Artists Agency(CAA) in 2006. Through Rose, he learned the art of management and contract negotiation. In 2011, Paul became the third agent of Lebron James and brought him into the CAA. In 2012, Paul decided to set up an agency of his own, and started Klutch Sports Group. The group now represents almost 20 basketball players, one of whom is James. Paul despite not having formal training in management brought his learning from CAA and makes sure that his management style is not just business but also on a personal level. He assists players with their career and their branding and also their personal affairs, including personal investments. Today, Klutch Sports Group has over $180 million worth of contract value and regularly makes almost $10 million in commissions; the company’s headquarters is located in Cleveland, Ohio. Rich Paul keeps his personal life very private – he says that he doesn’t mix business with pleasure! $10 million 1981-12-16 Africa African American Agricultural machinery Air gun Airsoft gun Akron Akron Beacon Journal American American sports agent Benedictine High School in Cleveland Businessman Cleveland Cavaliers Eric Bledsoe Friedrich Pauli Ohio owner of Klutch Sports Group Police Police officer producer Randy Mims Rich Paul Rich Paul Net Worth Trey Lyles U.S.